There’s roughly 30 minutes to kickoff and Nebraska’s entire team runs over to the northern-most corner of the visiting team sideline. Standing some 10 feet away from true freshman quarterback Adrian Martinez is Nebraska native Gabrielle Union and her husband, Dwyane Wade. “Oh my God, that’s D-Wade,” Martinez says as he looks over and sees the Miami Heat superstar taking pictures. Despite growing up in California, Martinez never really considered himself a Lakers fan. He’s always been a LeBron James fan, though, which means he watched James during his Heat tenure and watched Wade near the height of his powers. But Saturday wasn’t the time for pictures. It was almost like Wade distracted him for an instant, and then football immediately pulled his focus back. On a night when the 18-year-old was set to become the first true freshman to start at quarterback in Nebraska program history, a night when he was part of a completely revamped Tunnel Walk, a night when he was going to be tasked with making sure Scott Frost’s Nebraska debut went smoothly, the only stargazing that happened from Martinez came for 10 seconds well before it was time for football. Akron kicked off Saturday, lightning flashed inside an eight-mile ring around Memorial Stadium and before Martinez could call his first play, a Husker staffer was running out onto the field waving his arms to stop play. Martinez just pulled out his mouthpiece and shook his head. “I thought we were at least going to get a play off,” he said. They had a play ready. Martinez felt good about it, the rest of the offense did, too. 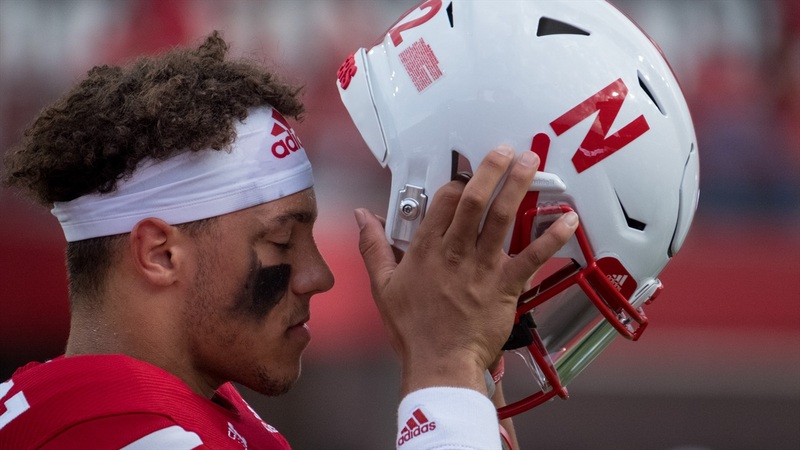 He wasn’t willing to share what that play was on Monday, but “you can just say it was going to be a good one.” More confidence from a kid who has flashed nothing but since arriving in Lincoln. On Saturday, his family was in Lincoln, too. All of them. Dad, step-mom, brother and step-sister were all in attendance to watch him play in person for the first time since his junior year of high school. Martinez said his father, Tony, will likely come back but that was the only chance this season for the rest of his family to see him play. “I would say that was one of the more disappointing things for me,” he said. Which makes it all the more impressive there appeared to be no trace of nerves anywhere prior to his first collegiate snaps. Before going out onto the field, Frost didn’t need to calm his quarterback down or re-focus him. He didn’t need to worry. All he needed to say were three simple things. “Take care of the football, play like you’re the best player on the field and play fast. He was ready to do those things,” Frost said. During his time at the podium Monday, Frost said earlier that morning the team had one of the best first-day-of-the-week practices he’s ever seen. So, yes, that sentiment absolutely extends to Martinez. Once Martinez found out the game wasn’t going to be played, he shifted attention to Colorado. He didn’t dwell on it Sunday; he came in for brunch, watched some CU film and then caught a little of the LSU-Miami game Sunday night. When Monday rolled around, it was go time. Since winning the quarterback job, Martinez has grown a little more into that leadership role that comes along with it. Quarterbacks coach Mario Verduzco initially cautioned him to not “forget what got [him] here,” but there haven’t been any complaints from the coaching staff. On Saturday, Martinez was one of the first to speak up about wanting to find a way to play the game.